(Nanowerk News) Imagine a computer so efficient that it can recycle its own waste heat to produce electricity. While such an idea may seem far-fetched today, significant progress has already been made to realize these devices. Researchers at the Nanostructured Materials Research Laboratory at the University of Utah have fabricated spintronics-based thin film devices which do just that, i.e. convert even minute waste heat into useful electricity. 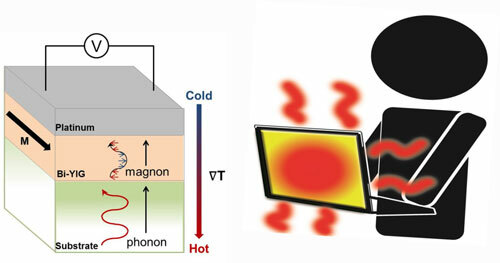 “As electronic devices enter the nano-size regime, the problem of heat generation is becoming more and more severe,” says University of Utah Materials Scientist Ashutosh Tiwari, who led the research published online Friday, March 21 in the Nature publishing group’s journal Scientific Reports ("Robust longitudinal spin-Seebeck effect in Bi-YIG thin films"). 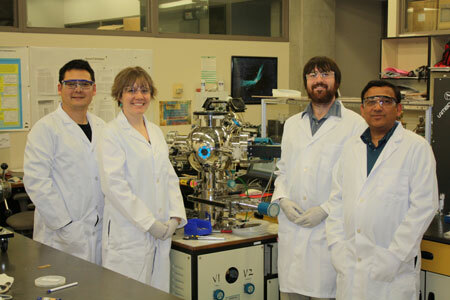 University of Utah materials scientist Ashutosh Tiwari and his doctoral students Gene Siegel, Megan Campbell Prestgard, and Shiang Teng have fabricated spintronics-based thermoelectric devices which convert even minute waste heat into useful electricity.